Soaking up the sun in my room with a sweet city view. Wild like the jungle, multifaceted like the city. After years of traveling and being away from home, I’ve come to love the vacation feeling of showing up in a entirely different environment, settling in, and playing local if even only for a few days or weeks. 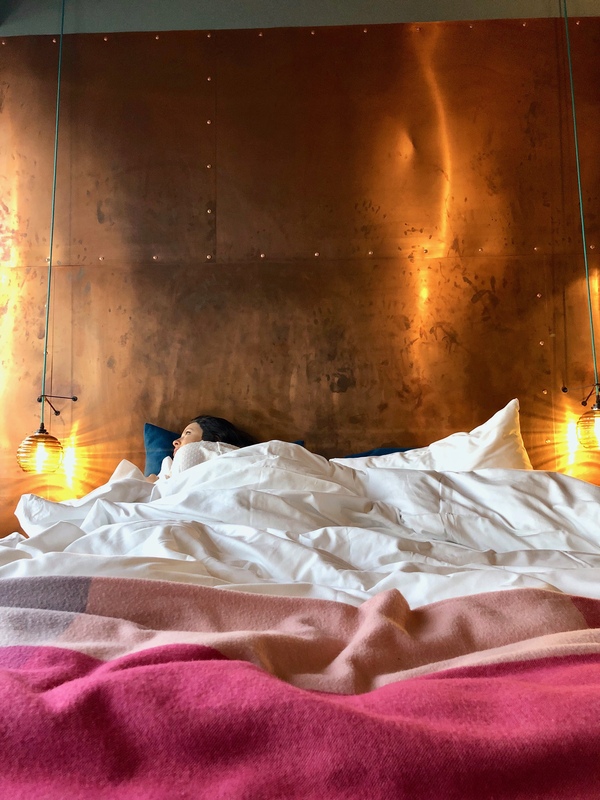 From Europe to Asia, I’ve been lucky to stay at hotels that are more than just a night’s sleep but an enveloping experience that makes the trip even better. 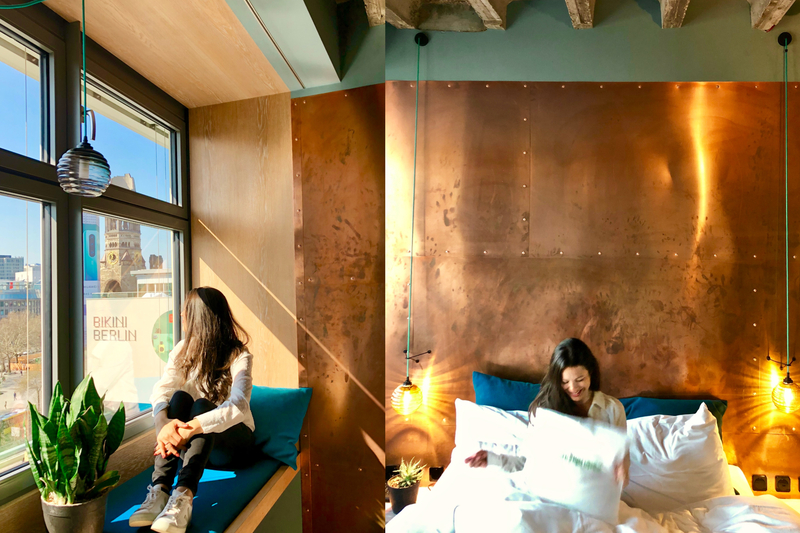 I’m also a sucker for details and can appreciate memorable and thoughtful design, so that’s why I was thrilled to visit 25Hours Hotel Bikini Berlin, a hotel that is intentional with their space and design, while not taking themselves too seriously. It’s a funky space in a funky city. 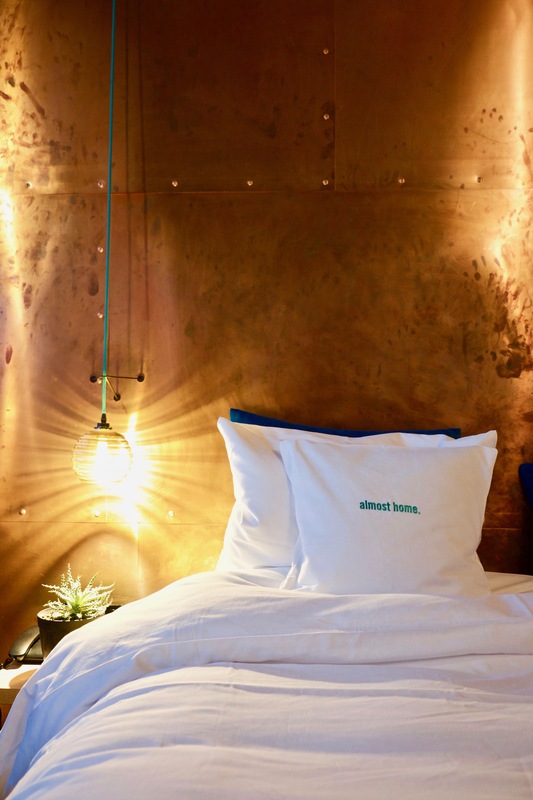 My recent trip to Berlin was the perfect chance to experience out a boutique hotel with attitude, style, but most of all, one that would match Berlin’s personality of creativity and edge. 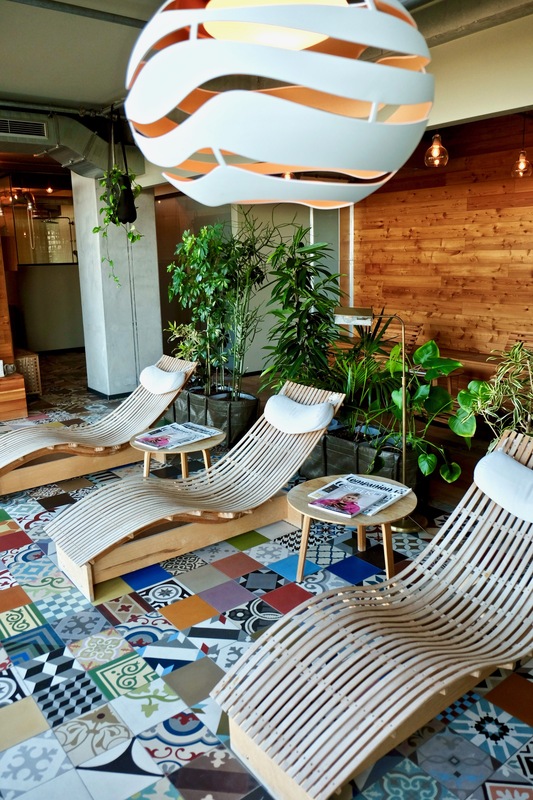 From trend setting tourists to hip locals, 25Hours Hotel offers something fun, interesting, and realxing for a city explorer and admirer of design. 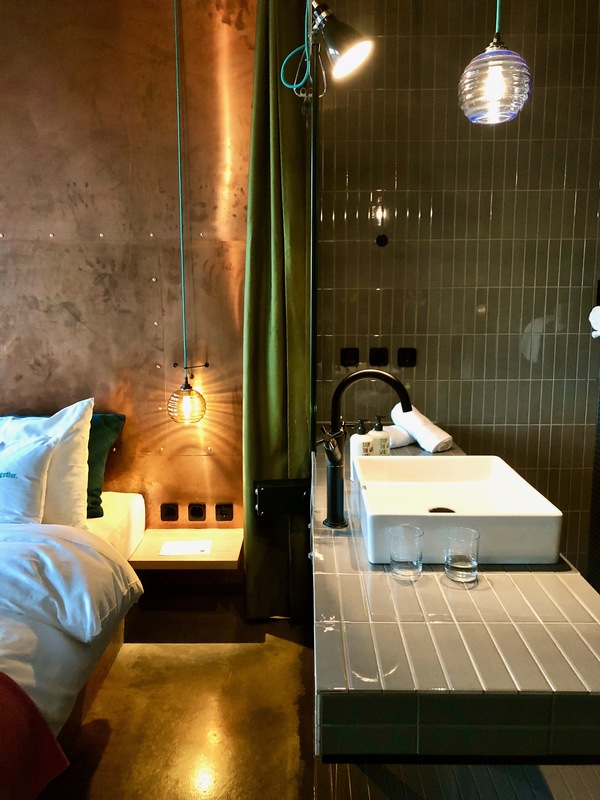 Disclaimer: my trip to 25Hours Hotel Bikini Berlin was part of a collaboration for this blog; all thoughts and opinions are my own. The hotel’s view onto the historic Bikini Berlin complex. Architecture aficionados will appreciate what Bikini Berlin’s stands for in a historical context. 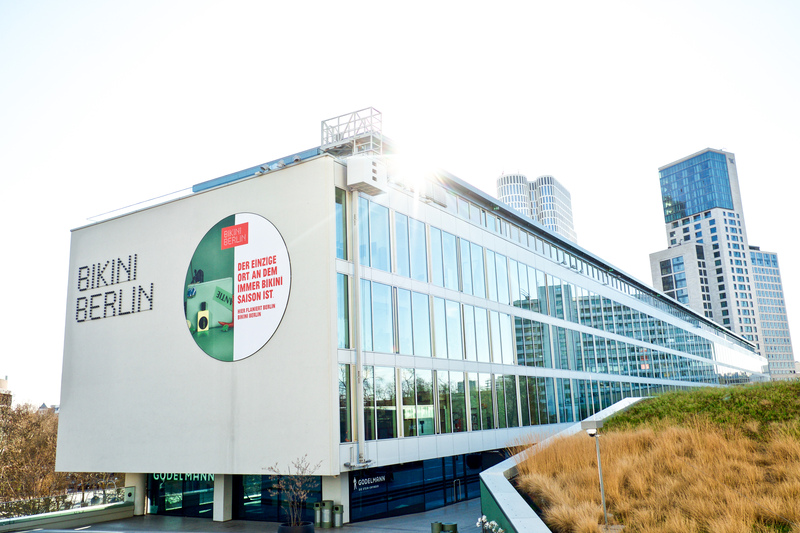 Bikini Berlin is Europe’s first concept mall with the reputation of adding a younger energy into West Berliln. Made up of five buildings, these modernist structures designed in the 1950’s by Paul Schwebes and Hans Schoszberger served as an expression of freedom, optimism and consumerism. 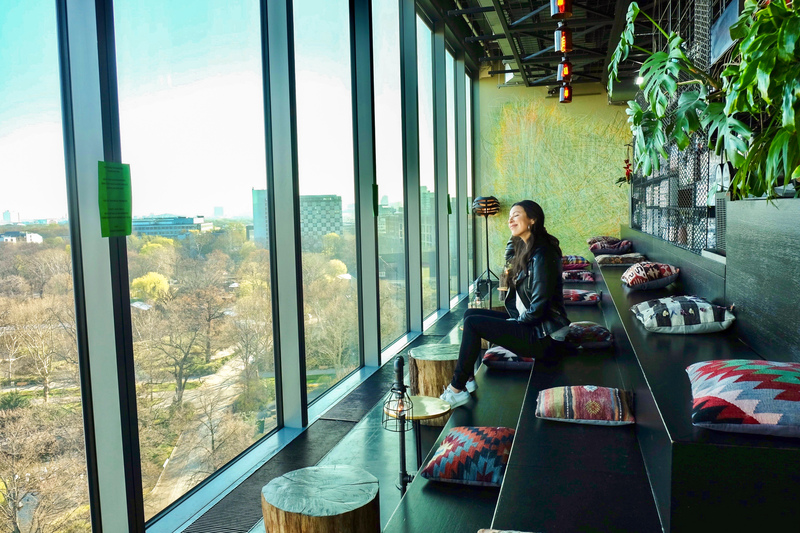 25Hours Hotel Bikini Berlin is a ten-storey tower block with 149 rooms to choose from (from the fourth to ninth floors), Built on top of ‘Bikinihaus’, half of the rooms face the lush zoo and the other half face out to views of West Berlin. This design of the Bikini Haus complex was an answer to the ‘pompous’ style of Kaiser Wilhelm and the neoclassical architecture the Nazis were known for. The hotel building itself was designed by Studio Aisslinger and drew inspiration from his travels to São Paulo. 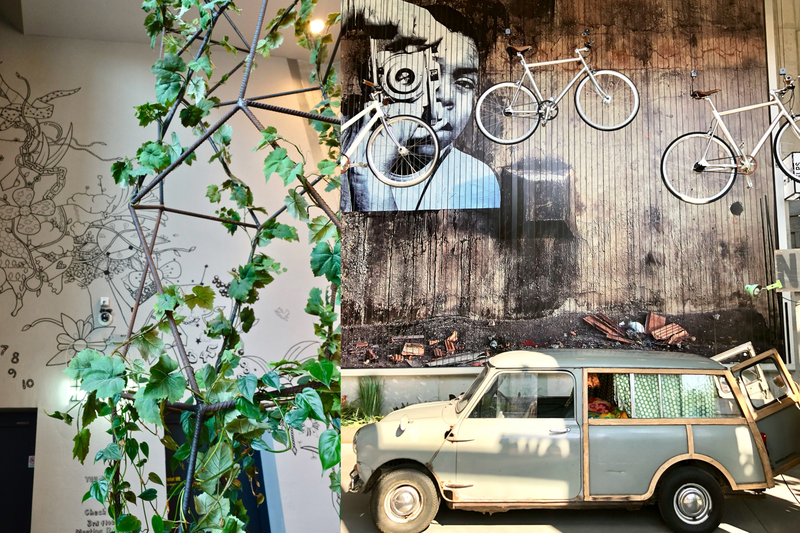 Funky, colorful and playful touches are executed with sophistication and style throughout the hotel, always tying back to the them of an urban jungle. Not your average lobby! You won’t find the reception here. Ride the elevator up to the 3rd floor. 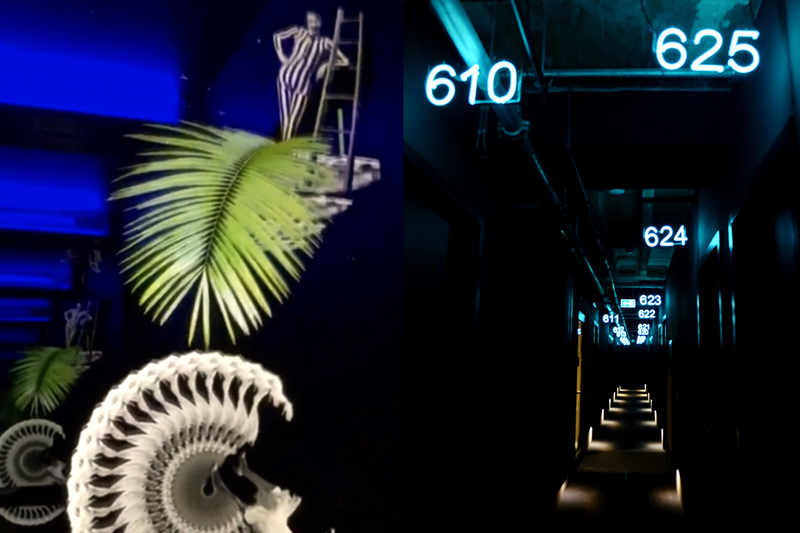 The funky hotel elevator with moving animations up to my neon sign lit hallway. 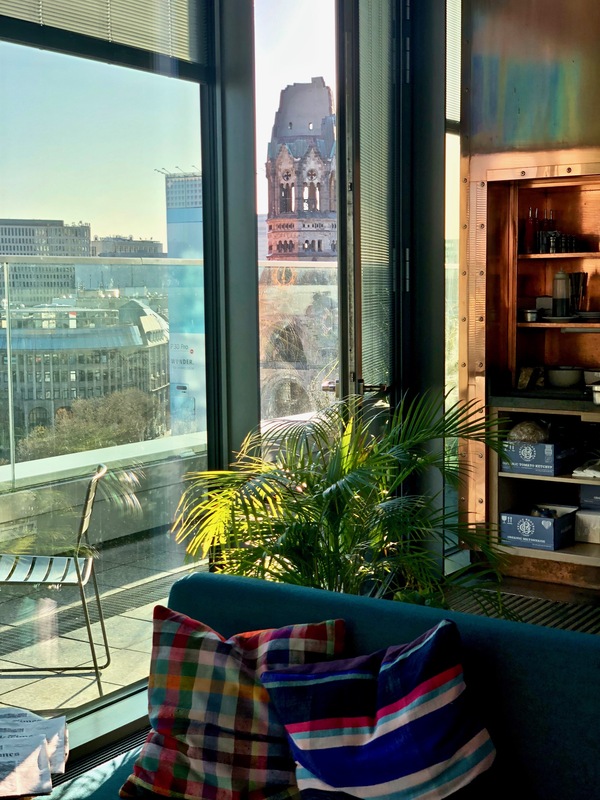 Choosing your room really just means choosing your preferred view! 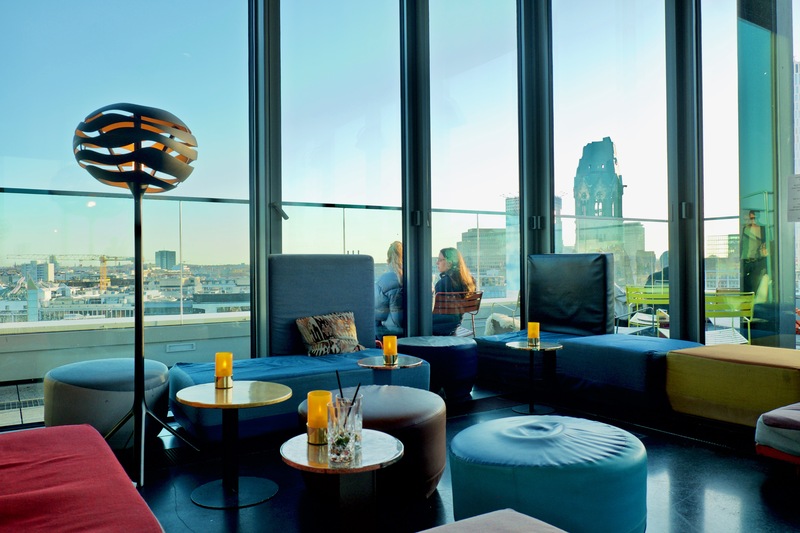 For guests who want an edgier feel with views over Berlin’s landmarks and cityscape, go for the Urban rooms. During my stay, I was in an Urban M overlooking the famous Kaiser-Wilhem Memorial Church, a symbolic ruin to World War II raids – a really impressive landmark to see in person. Rooms start from €120. 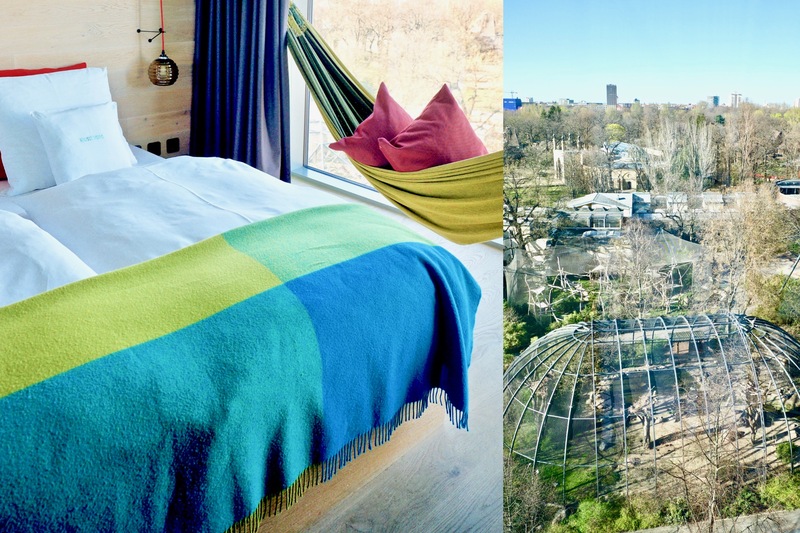 For those hoping to spot some monkeys or elephants down in the zoo, there are jungle views in the Jungle Rooms, complete with a hammock to gaze down below. The bathroom and walk-in shower are outfitted with sleek black tiles for a modern feel. Another nice touch? 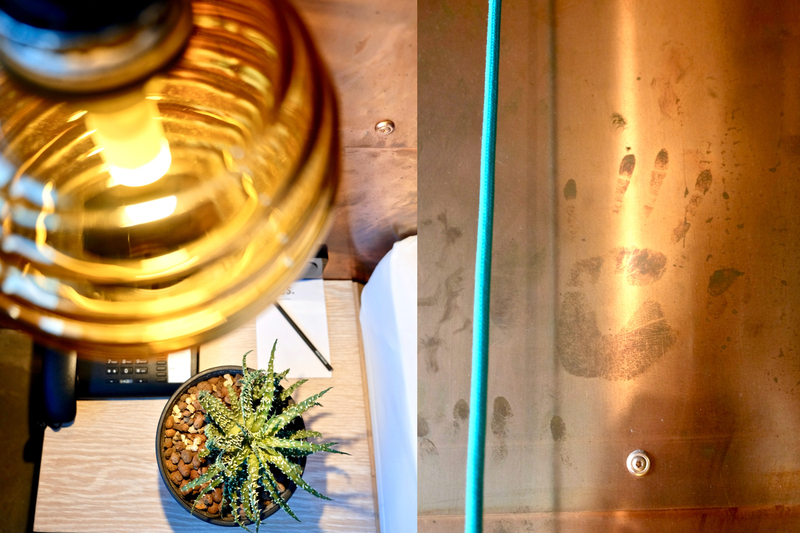 Each room features wall illustrations that were hand drawn by Artist Yoshi Sislay and took three months to complete. 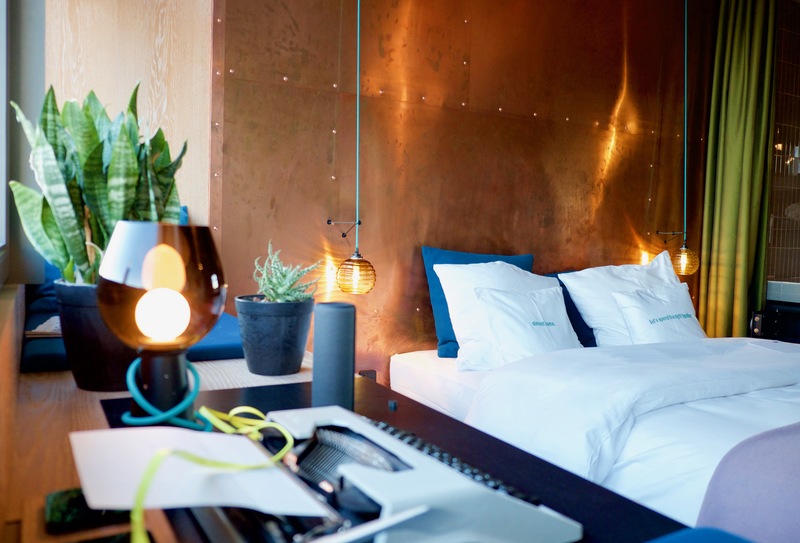 Urban M rooms have everything you could need like a super plush and comfortable queen size bed, A/C, a flat-screen TV, a bluetooth speaker, rain shower, a Freitag tote to take with you during the day, and more. For guests on the move? 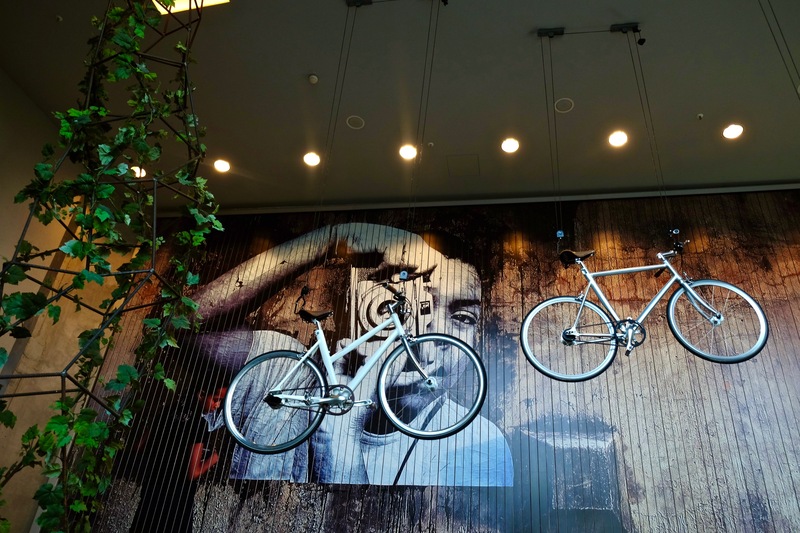 You can enjoy free MINI car and bike rental which is included in the stay. The only downside was my room didn’t have a mini-bar as listed. What a great night’s sleep looks like. A two-sided mirror separates the Urban M bathroom sink and bed. 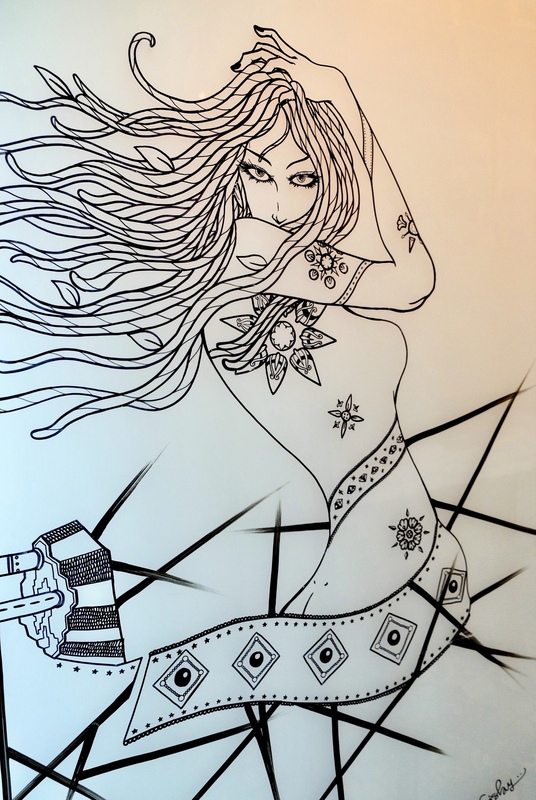 Wall art ilustrations by Yoshi Sislay. 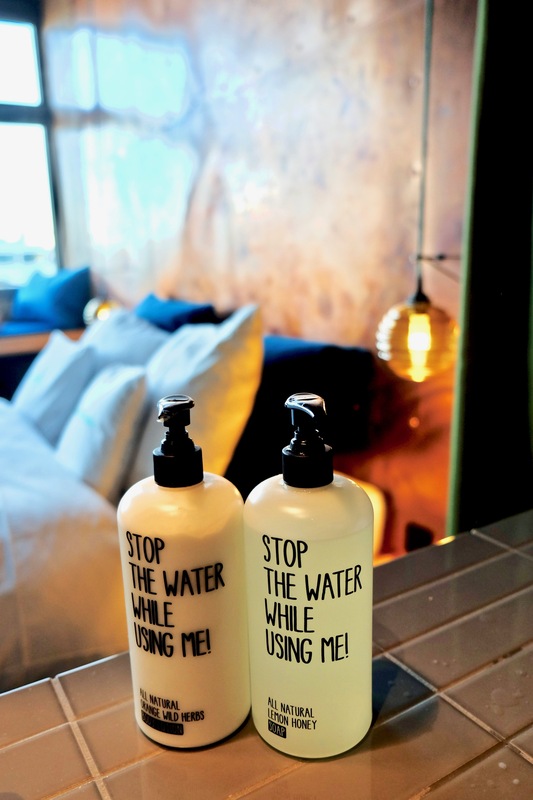 All rooms have Stop the Water While Using Me! soaps. Jungle M room views looking down into the monkey enclosure at the zoo. 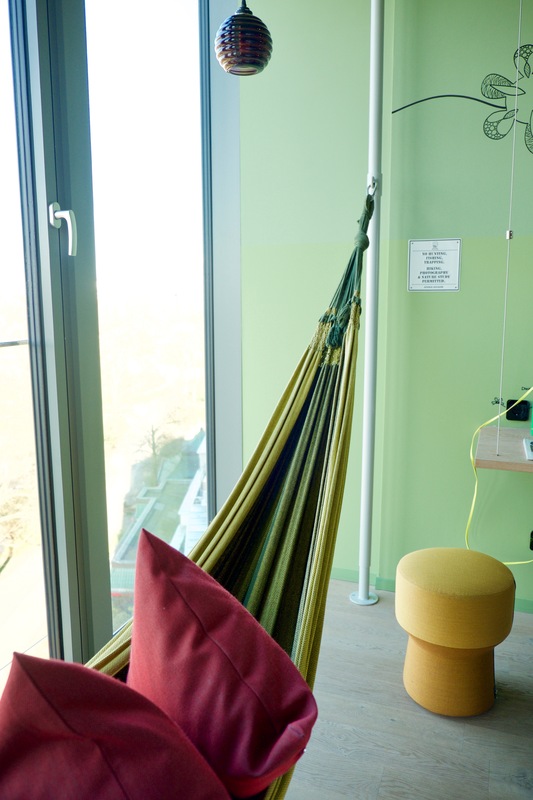 On the third floor left of the reception, three giant hammocks suspend from the wall making for a perfect hang out with a coffee, cookie, or just for a nice nap. The in-house bakery serves sinful desserts and strong coffee. 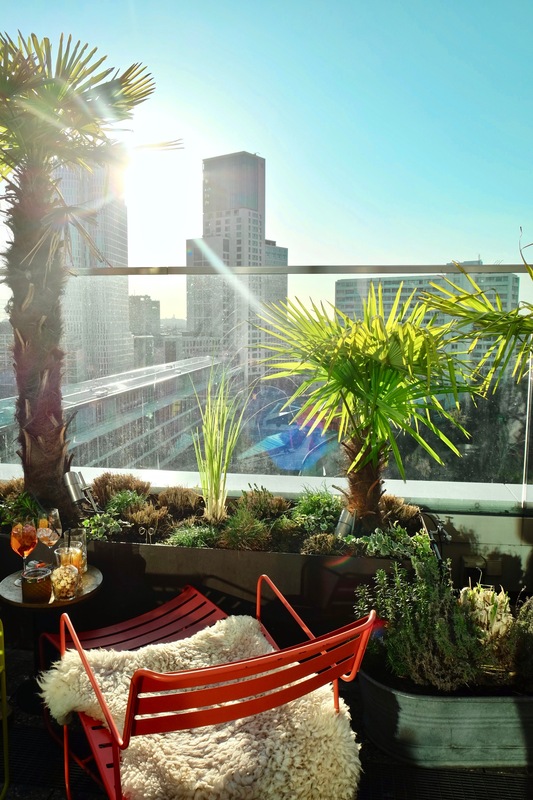 Oh yeah, there is also a zoo view to admire while you lounge. 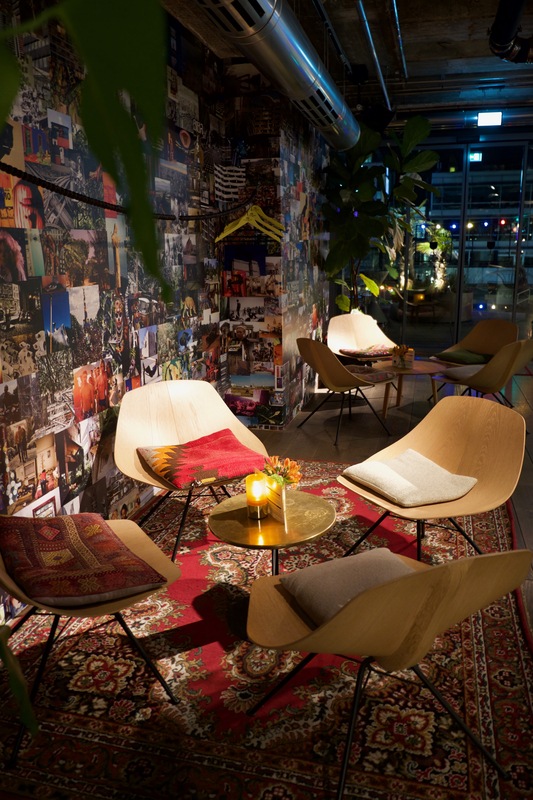 For shopping lovers who want to take a piece of Bikini Berlin back with them, their merch corner offers books, knick knacks, and pillow cases with cheeky phrases, like “Almost home”, and “Let’s spend the night together”. 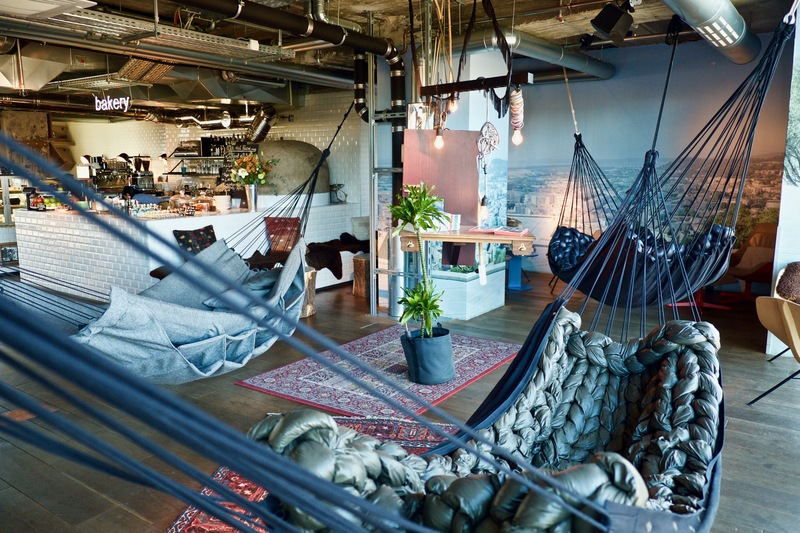 The giant hammocks next to the in-house bakery. 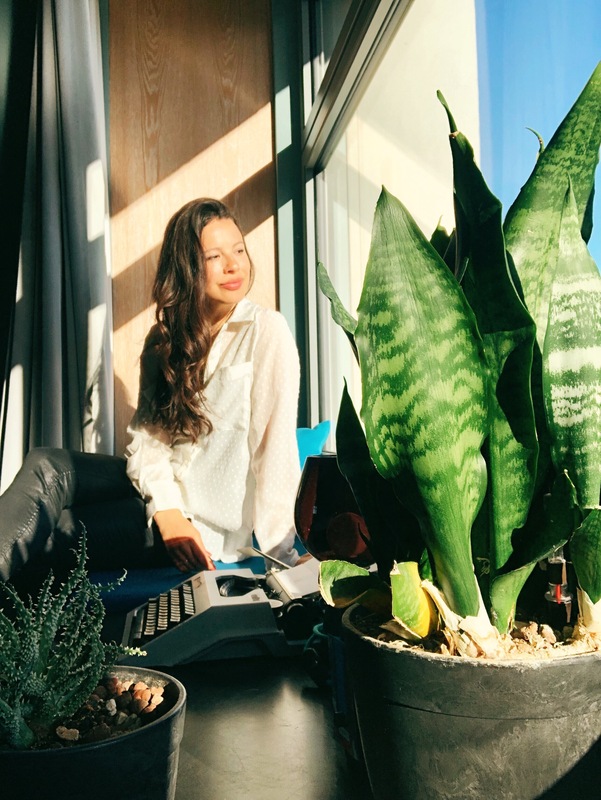 A lush newscorner to read up on the daily news or check emails. The bakery area by night. As if the ground floor, reception, and rooms weren’t eye-catching enough, I headed up to the 10th floor to see what was going on in the restaurant and bar area. 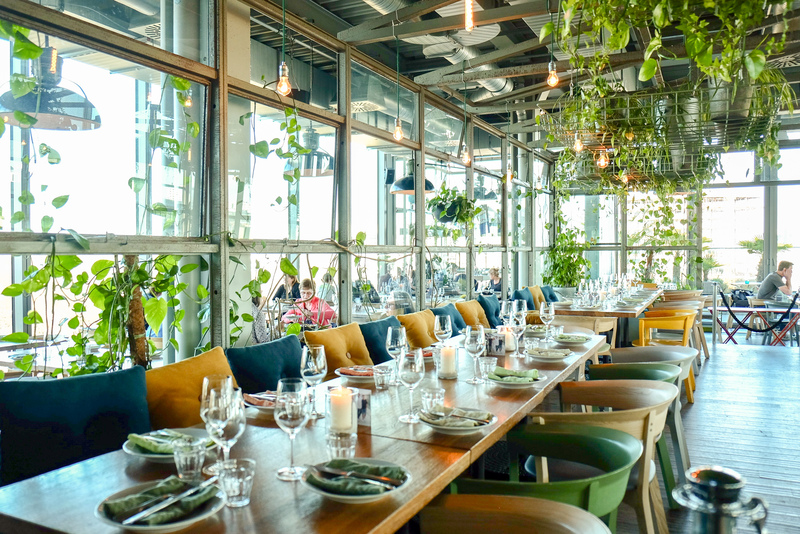 Once you enter through the Monkey Bar doors, turn right down the dark hallway, and you’ll be met with breathtaking 360 panoramas and an open and airy dining room with greenhouse vibes to bask in. 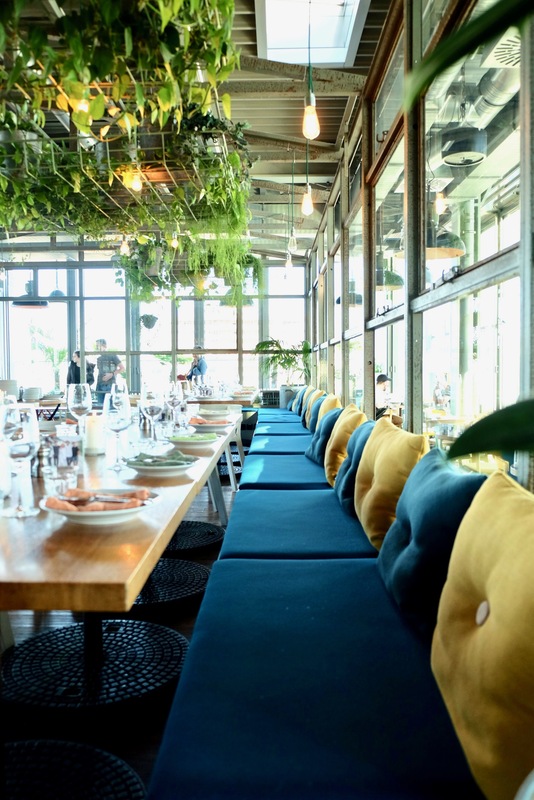 NENI offers Israeli-Oriental cuisine with a fabulous view of City West and the Zoological Garden. It’s a popular dinner spot so be sure to make a reservation. I showed up on Monday evening unannounced and there weren’t any free tables left. 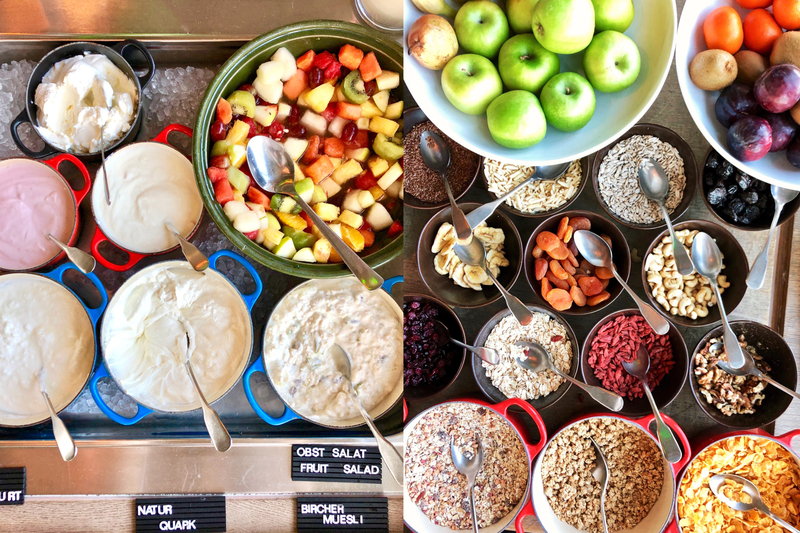 As a major breakfast lover, I was excited to see a hotel buffet breakfast with fresh and interesting options like fresh juices, smoothies, coffee and tea stations, and hot items like Berlin’s famous curry wurst pork sausages, bacon and eggs, and more. The cold bar featured smoked salmon, sliced meats, cheeses, an island of cereal options, yogurt, and baskets of delicious and varied breads. Whether you opt for hot or cold, expect colorful crockery to liven up your plating process. NENI’s green house atrium dining area. This colorful bench is everything. The beautiful buffet spread at NENI. 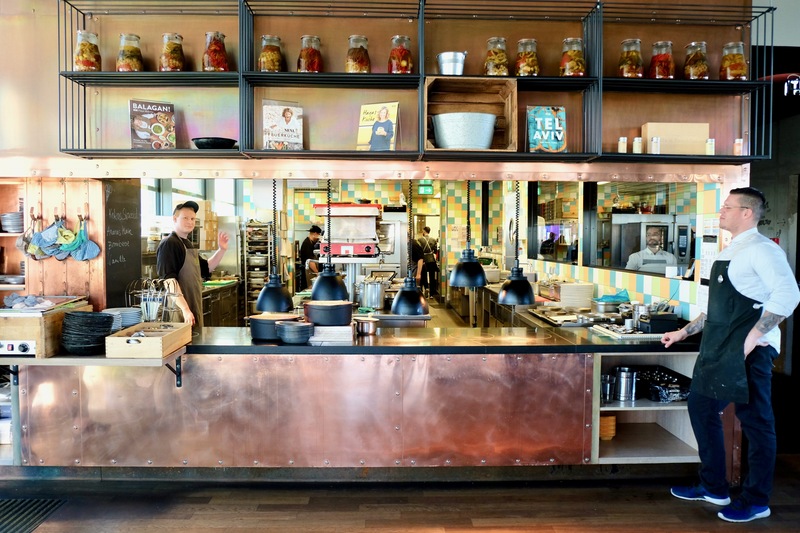 A view inside the open kitchen. 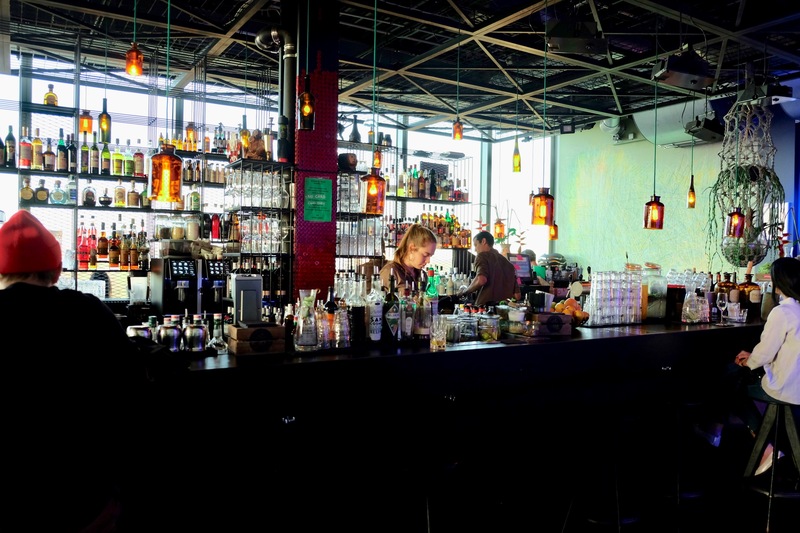 Once I pushed open the doors to the tenth floor, I was overcome by the loud sound of people chatting over their after-work drink. 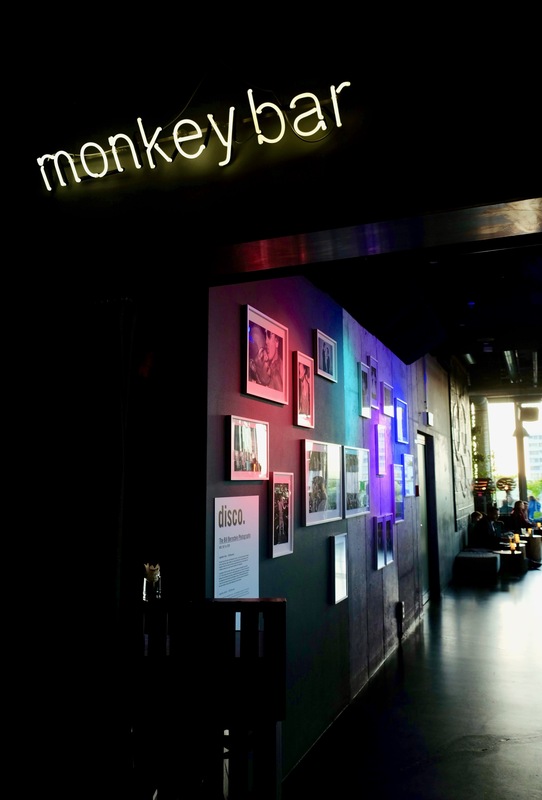 There was no mistaking I was at Monkey Bar, voted one of Europe’s best hotel bars only a few years ago. On the wall to the right of the door was something I didn’t expect to see: a permanent exhibition of Bill Bernstein photography — iconic mmoments of Studio 54’s patrons and all their disco indulgences. 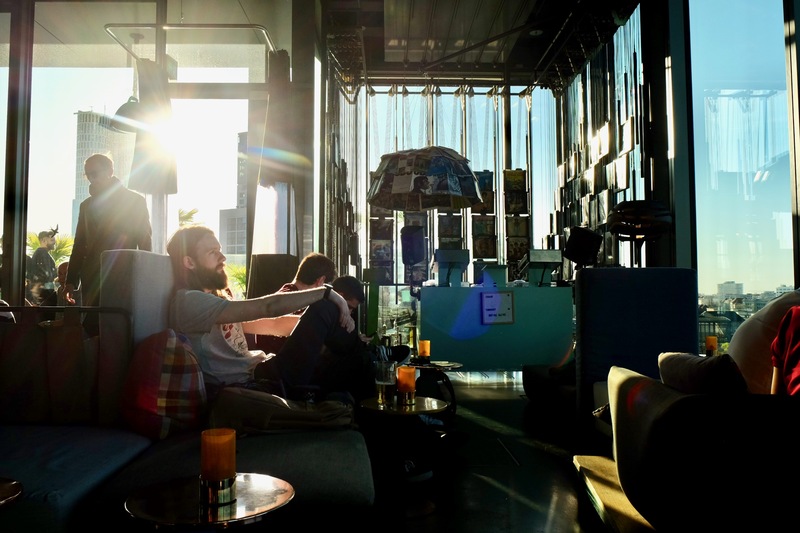 The bar is full of giant windows that let in loads of light and makes for perfect 360° views at sundown. 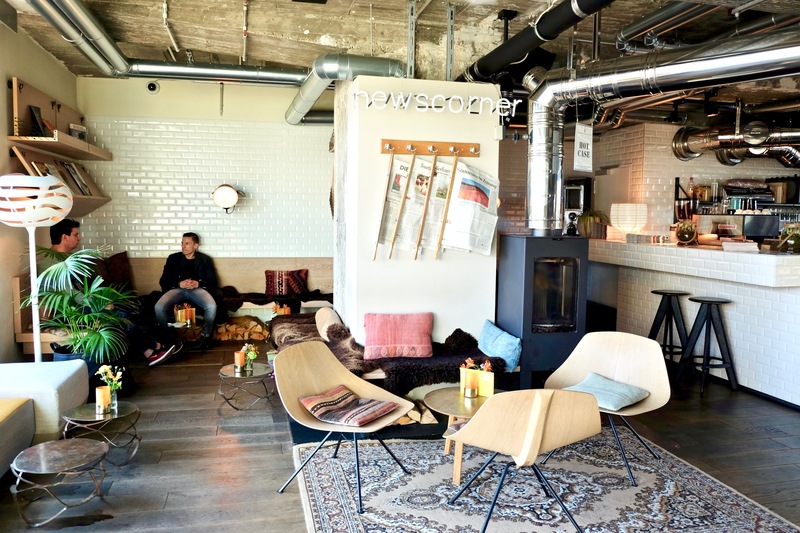 Low lying couches, tiered benches, a mix of metals and woods with colorful mismatched cushions give this bar a cool bohemian touch. To wind my day down, I ordered a big refreshing beer and struck up conversation with a local Berliner who lived nearby but said he liked to come by for the sunset. 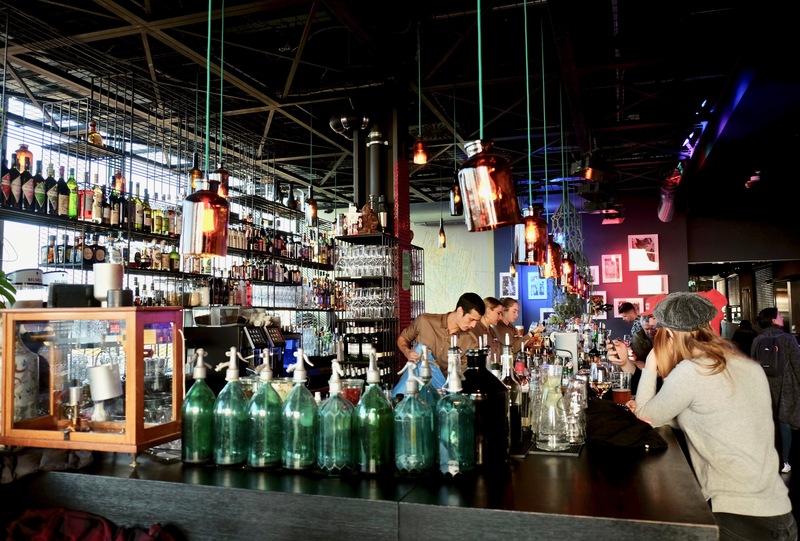 For music lovers coming to Berlin: a DJ spins most nights of the week! 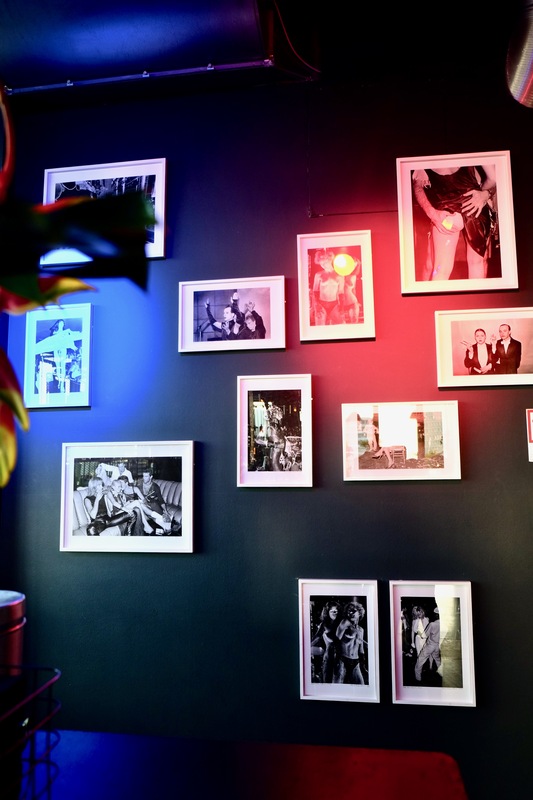 Iconic Studio 54 Bill Bernstein photographs are on display in Monkey Bar. This tiered bench overlooks the zoo away from the hustle and bustle of the bar. 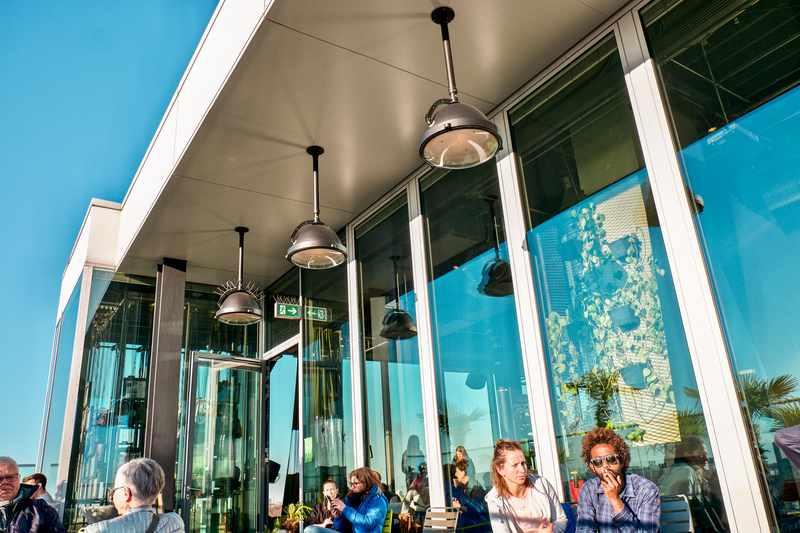 The sunny and window filled terrace at Monkey Bar. I enjoyed my rum and coke right here in the sun. Perfect! I love the detail of glass bottle lamps at the bar. 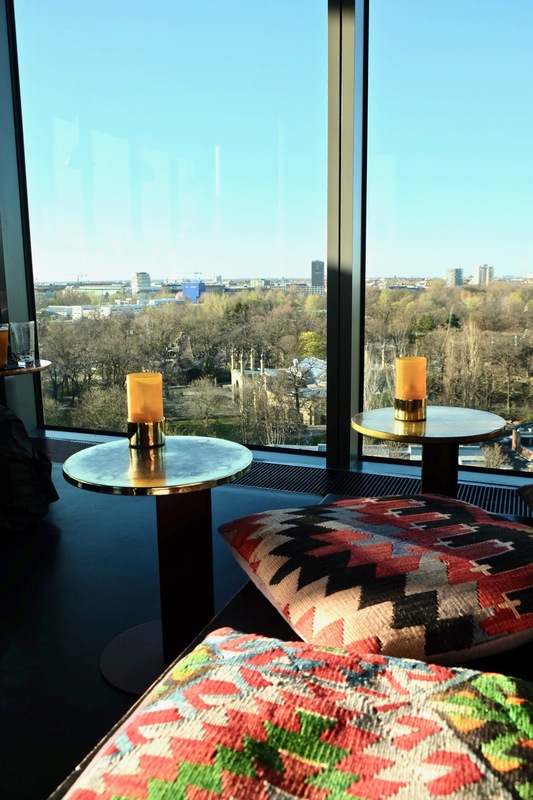 Low lying cushions add a casual feel for an after work happy hour. This corner is perfect for admiring Memorial Church. I always say the mark of a good hotel is an even better sauna. 😉 No, there’s no pool at 25Hours but they do have a sauna that feels like an oasis inside an oasis. 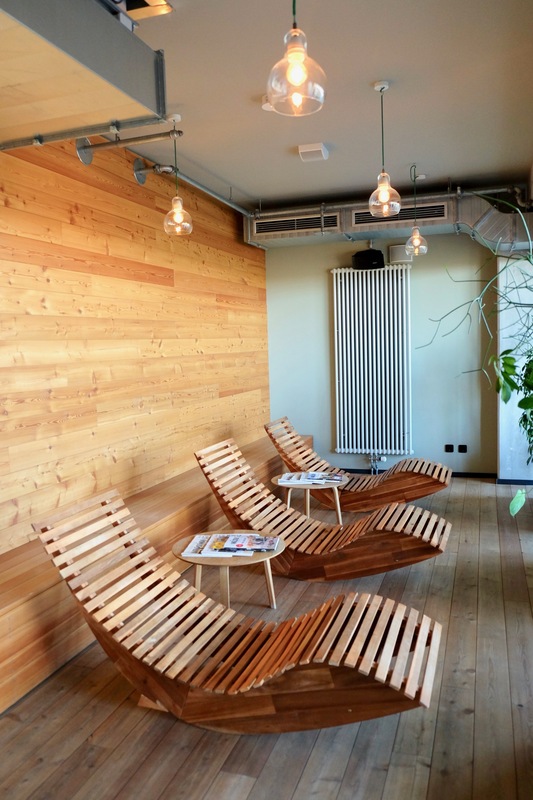 Once you walk through a dark corridor on the ninth floor, you’ll open the door to this lush and bright sauna space. 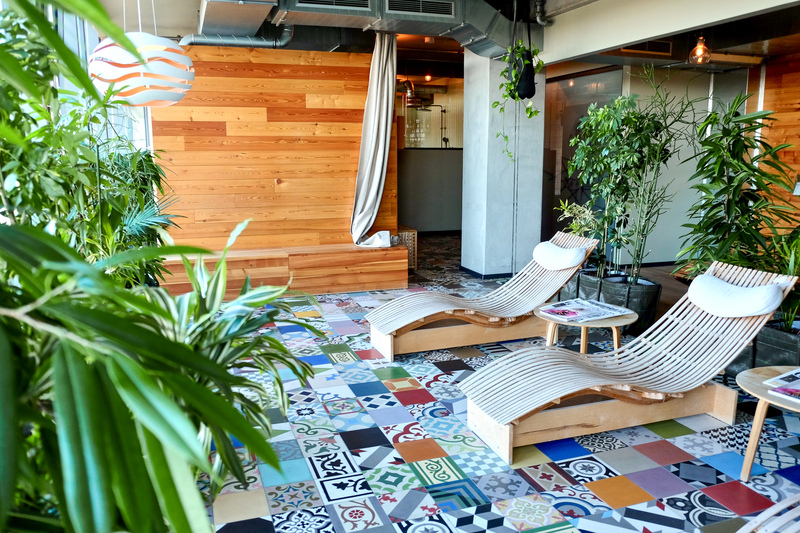 Colorful tiles lead you past refreshments around the corner to an open and light filled space to sleep, read, and relax. 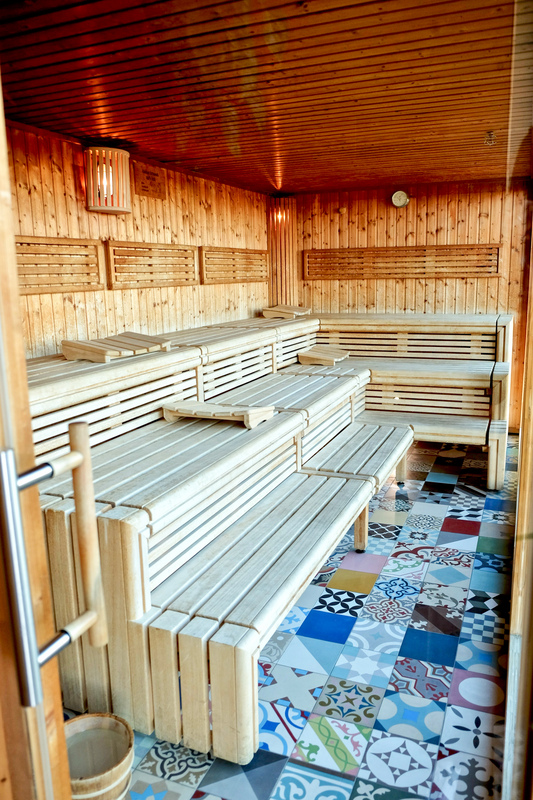 The dry sauna itself is a sight for sore and tired eyes. It also overlooks the zoo and Tiergarten Park. All in all, 25Hours has exactly what I love in a hotel. Its atmosphere and ambiance are so intruiging that it’s tempting not to leave at all. I could have easily stayed longer just to enjoy and hang out in the sauna for hours. 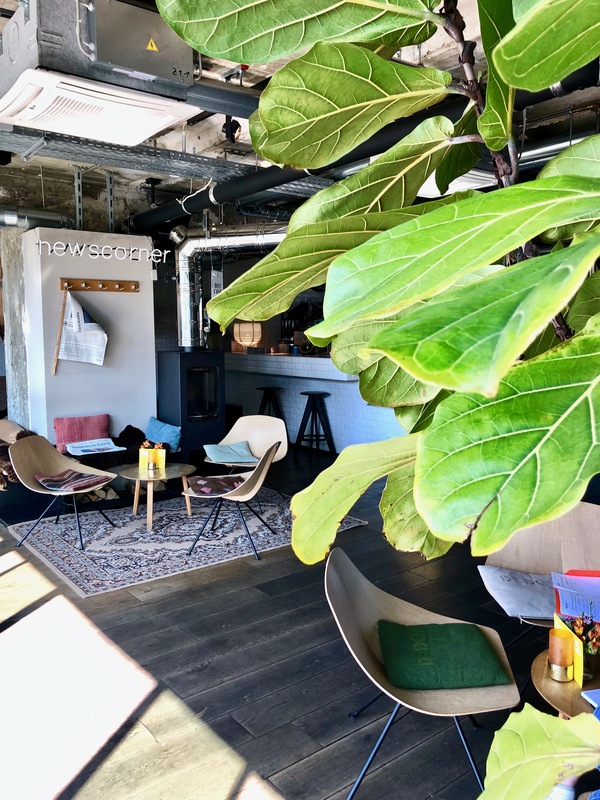 For what you get, the price point is really reasonable, the service friendly and prompt, and the hotel’s location is a refreshing alternative to more touristic spots in Berlin like Mitte. 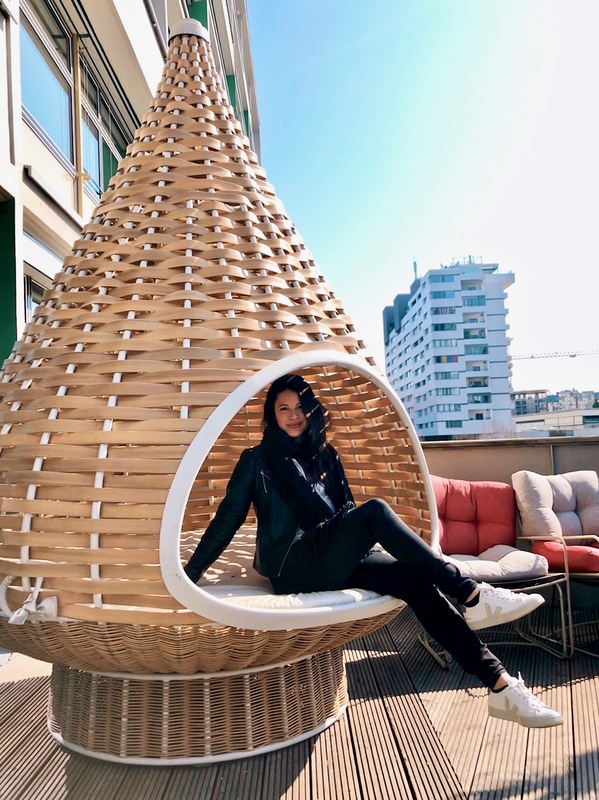 On my next trip, I’ll be back to Berlin just to hang out a bit longer in those hammocks, to melt away in the sauna, and saunter up to dinner at NENI for those gorgeous city views.